Given that the suite remains in beta, it’s not shocking that Apple’s iWork for iCloud apps are still being lavished with updates. The latest set arrived on Thursday, with improvements for all three apps in the productivity suite. Password protection is perhaps the most prominent new feature in this latest update. 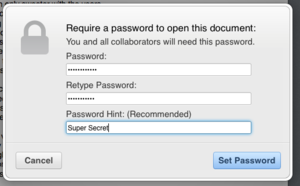 Top of the list is the ability to add passwords to documents, and to share those password-protected documents with other users. 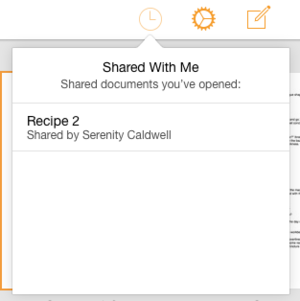 For each app, you can also now see a list of the files that other users have shared with you, though iWork only seems to include documents that have been shared with you and that you’ve opened. All three apps also now support keyboard shortcuts that let users precisely manipulate objects, allow you to apply rich formatting to text in table cells, and feature improved VoiceOver support for the document manager. And, of course, the entire suite has received the obligatory bug fixes and stability improvements. Each app now also lets you see a list of documents you've opened from other users. Each app has additionally received its own specific upgrades. 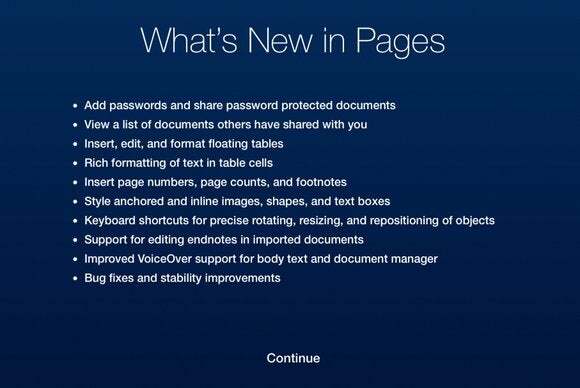 Pages, for example, now allows users to work with floating tables and also supports inserting page numbers, page counts, and footnotes. Other improvements include styling anchored and inline images, shapes, and text boxes, as well as the ability to edit endnotes in documents you’ve imported. In addition to the shared updates, Numbers also adds the ability to flow text into adjacent cells. Keynote, like Pages, allows users to work with floating tables. While the iCloud versions of iWork didn’t meet with as much criticism as the changes made to the iOS and OS X editions, Apple has made it clear that its ultimate goal is parity between the features on all three platforms. Currently, the Web versions seem to lag behind the most, but these and other recent updates show that Apple plans on closing that gap, much as it announced its intention to restore missing features in subsequent updates to the mobile and desktop suite.